Sarah Nader- snader@shawmedia.com Prairie Ridge's Emma Gaynor celebrates a point during Thursday's Class 4A Crystal Lake South girls volleyball regional final against Crystal Lake South Oct. 27, 2016. Prairie Ridge won, 29-27, 22-25, 25-21. 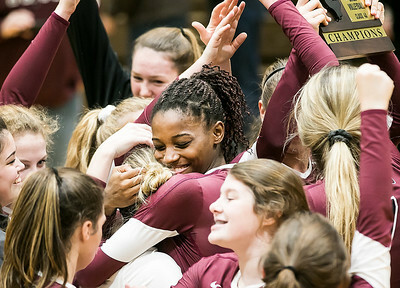 Sarah Nader- snader@shawmedia.com Prairie Ridge's Genesis Sheridan celebrate Thursday's Class 4A Crystal Lake South girls volleyball regional final win against Crystal Lake South Oct. 27, 2016. Prairie Ridge won, 29-27, 22-25, 25-21. 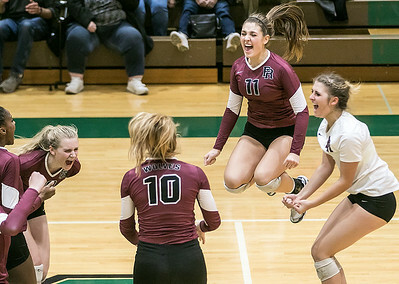 Sarah Nader- snader@shawmedia.com Prairie Ridge's Olivia Annen (center) celebrate during Thursday's Class 4A Crystal Lake South girls volleyball regional final win against Crystal Lake South Oct. 27, 2016. Prairie Ridge won, 29-27, 22-25, 25-21. 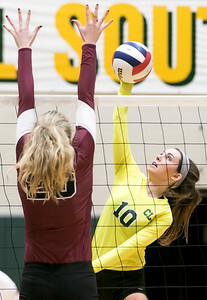 Sarah Nader- snader@shawmedia.com Crystal Lake South's Emily Slimko jump to block a ball hit by Prairie Ridge's Olivia Annen during Thursday's Class 4A Crystal Lake South girls volleyball regional final at Crystal Lake South Oct. 27, 2016. Prairie Ridge won, 29-27, 22-25, 25-21. 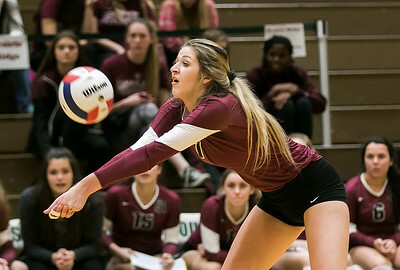 Sarah Nader- snader@shawmedia.com Prairie Ridge's Erin McNeil returns the ball during Thursday's Class 4A Crystal Lake South girls volleyball regional final against Crystal Lake South Oct. 27, 2016. Prairie Ridge won, 29-27, 22-25, 25-21. 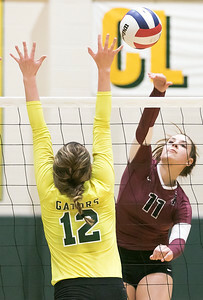 Sarah Nader- snader@shawmedia.com Prairie Ridge's Allison Cole jumps to block the ball during Thursday's Class 4A Crystal Lake South girls volleyball regional final against Crystal Lake South Oct. 27, 2016. Prairie Ridge won, 29-27, 22-25, 25-21. Sarah Nader- snader@shawmedia.com Crystal Lake South's Yiannoula Kirimis jumps to block a ball during Thursday's Class 4A Crystal Lake South girls volleyball regional final against Prairie Ridge Oct. 27, 2016. Prairie Ridge won, 29-27, 22-25, 25-21. 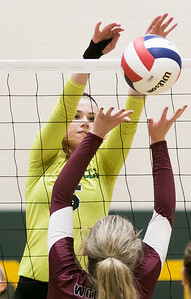 Sarah Nader- snader@shawmedia.com Crystal Lake South's Aurora Nero hits the ball over during Thursday's Class 4A Crystal Lake South girls volleyball regional final against Prairie Ridge Oct. 27, 2016. Prairie Ridge won, 29-27, 22-25, 25-21. 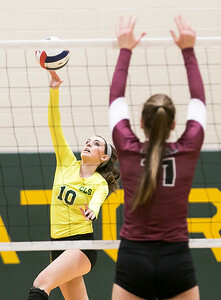 Sarah Nader- snader@shawmedia.com Crystal Lake South's Kleja Cerniauskaite hits the ball over during Thursday's Class 4A Crystal Lake South girls volleyball regional final against Prairie Ridge Oct. 27, 2016. Prairie Ridge won, 29-27, 22-25, 25-21. 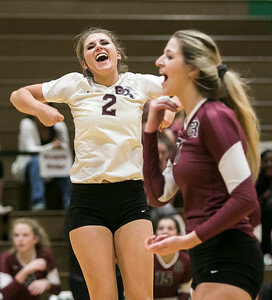 Sarah Nader- snader@shawmedia.com Prairie Ridge's Mackenzie Garis (left) and Erin McNeil celebrate during Thursday's Class 4A Crystal Lake South girls volleyball regional final win against Crystal Lake South Oct. 27, 2016. Prairie Ridge won, 29-27, 22-25, 25-21. 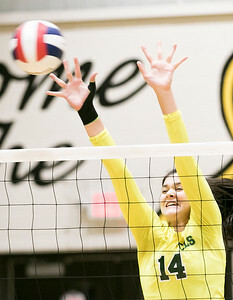 Crystal Lake South's Kleja Cerniauskaite hits the ball over during Thursday's Class 4A Crystal Lake South girls volleyball regional final against Prairie Ridge Oct. 27, 2016. 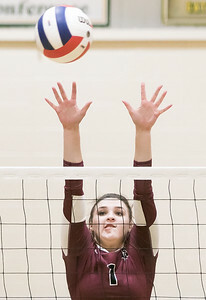 Prairie Ridge won, 29-27, 22-25, 25-21.